When a major storm or hurricane comes through your area, there are often downed trees. There is some coverage as outlined below, but it's typically minimal in comparison to the damage a falling tree can cause. Here are some of the most common questions that we here related to fallen trees and insurance coverage. Q: What coverage is available for the removal of fallen trees? A. If a windstorm or weight of snow, sleet or ice causes a tree to hit your home or another insured structure such as a detached garage or shed, a standard home insurance policy generally covers damage the tree causes to the structure and contents within it (when the damage causes a hole in the building). It also provides limited tree debris removal coverage of up to $500 when a tree hits a covered structure. If a tree just falls in your yard, it’s generally not covered. In some cases, insurance companies may offer a special endorsement that provides $500 or slightly higher amounts of tree debris removal coverage when a covered building is not involved. It’s important to remember that tree coverage is subject to your policy deductible, and the cost of removing a tree may fall within a typical $500 or $1000. But, don’t assume that you’re not covered; it’s always good to ask your agent. Q. If a neighbor’s tree falls on my house, whose policy covers it? A. Your policy covers damage to your home, so your insurance policy would provide the coverage. In some cases, if the tree was in poor health and/or not properly maintained, your insurance company may try to be reimbursed by your neighbor’s insurance company through a process called “subrogation”, which may allow you to be reimbursed for your deductible. Q. Does insurance cover removal of a tree before a storm to protect a house from the tree potentially falling on it? A. No. While taking preventative measures to avoid a tree crashing onto your home is wise, general maintenance isn’t something covered by insurance policies. Yes, it’s true that removing a tree isn’t cheap, but considering that tree removal coverage is limited after a tree falls, it’s better to take a tree down before it damages your house and potentially injures someone. Would you rather control how the tree comes down or have mother nature drop it randomly on your property? My choice would be to control it. Q. If a tree falls on my car, what insurance policy covers damage? A. Cars damaged by a falling tree are covered under the comprehensive coverage part of your auto insurance policy. If you have a car that you only drive seasonally and take off the road, it’s important to keep comprehensive coverage on the vehicle even while it’s in storage in case it is damaged by fire, falling trees or other covered situations. This is a general discussion of the issue. We recommend reviewing your policy and speaking with your agent for specific details about the coverage you;ve purchased. Murphy Insurance Generally, if a tree falls on your property, even if it's roots were on someone else's property, you would be responsible for removing it. Unless the tree was obviously not in good health and you had reported it to the property owner previously and there was negligence. 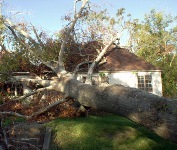 If a tree that otherwise appeared healthy falls, removal costs are typically up to the property owner where it falls. Murphy Insurance Generally, even if a neighbor’s tree falls on your property, it’s still your responsibility to remove it whether or not it hits a structure. You may have some insurance coverage if your home policy has an endorsement that extends coverage for tree debris removal for siutations when a tree doesn’t hit a structure; however, it will only pay up to the tree removal limit (usually $500 after applying the deductible). You would still be responsible for the balance. If you have questions about a tree falling situation, it’s always best to contact your agent to determine if you have coverage. A tree from I property I rent fell and damaged neighbors house, who is responsible for the damages? Murphy Insurance The property owner of the property damaged (on which a tree falls) is responsible the the damages. Only if negligence is involved would the issue of where the tree is rooted become an issue. If you are a Murphy Insurance customer please contact our claims department or if not then contact your agent. Great information. Sometimes it pays to be pro active.